Survival 101 re-imagines leveling rods from a 1918 photograph depicting an all-female survey crew. All symbols are hand-carved in recycled wood and integrate historic designs with barcode references. Video performance is also integrated further playing with notions of obsolete and emerging technologies. This performance took place at the 2012 Mapping Meaning workshop. Participants were introduced to basic signaling techniques as well as emergency Morse code. This culminated with the entire group performing together using signal mirrors to explore through collaborative action the constant state of emergency we find ourselves negotiating. Depending upon weather conditions flashes can be visible up to 50 miles away with the record rescue being 105 miles. These particular signal mirrors were collected from a variety of online sites and included everything from WWII military issued mirrors to wilderness survival and campfire mirrors. 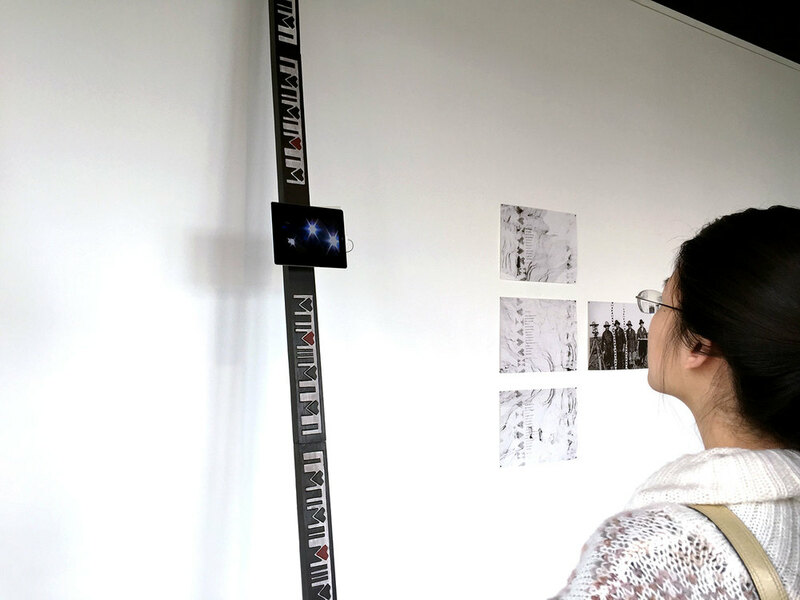 This photographic installation is a double document visually linking Mapping Meaning with an image from 1918 depicting an all-female survey crew. Map covering a one-mile radius with Capitol Reef Field Station as the center. Participants were asked to draw, doodle, and write on the map defining the spaces and places they visited during Mapping Meaning. The intent was to coalesce into one map the different paths, perspectives, and levels of engagement with the earth. Choice Encounters sparks a dialogue about how we construct communities, either as near as Arlington or as far as the American West. In the exhibition, the artists become both the catalysts and the creators for building collective spaces, often challenging visitors to (re)consider their own environments and become contributors. Through their work, artists Krista Caballero and FreeSpace Collective duo Billy Friebele and Mike Iacovone harness community engagement to make sense of our urban and national landscapes, and the connections between people and place. For these artists, the artwork is the network created, the activities organized, and the collaborative process itself, possible through their choice encounters. In the gallery, Caballero documents a nugget of forgotten American history. 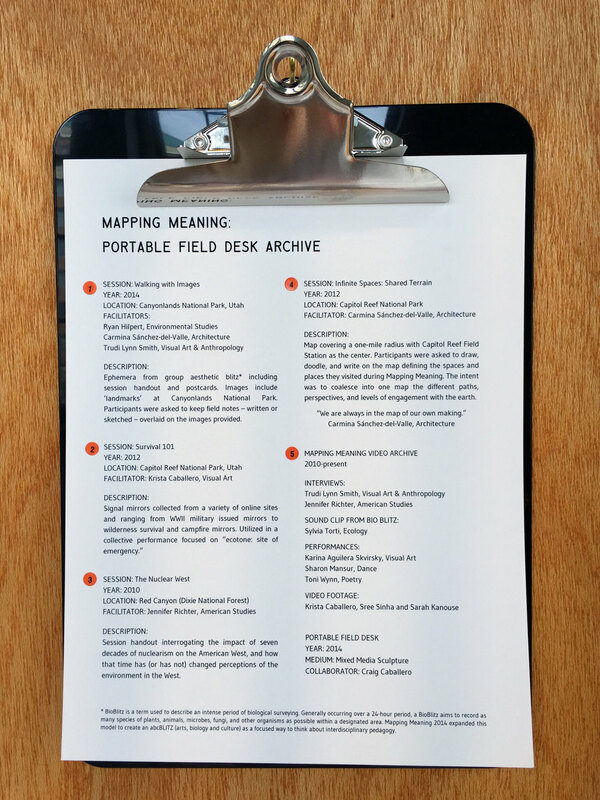 Mapping Meaning began when the artist found a photograph originally from the U.S. Bureau of Reclamation records. The archival image depicts an all-female team of surveyors in 1918, dressed in rugged gear and holding a pair of leveling rods covered in cryptic-looking symbols. Finding little background on the photograph, Caballero has spent the past five years trying to make sense of this lost community and history. In that quest, she has put together her own survey groups, comprising women from the arts, sciences, and humanities. 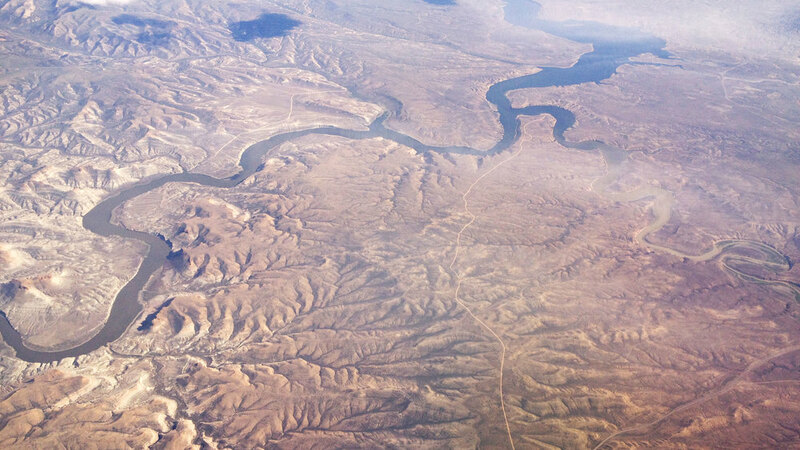 These experimental workshops, held in Utah in 2010, 2012, and 2014, look to ecological, cultural, and technological histories of the American West to understand what defines a place. This includes her recent “abcBLITZ” workshop where participants borrowed the models of biological surveying to collect an intense and random sampling of arts, biology, and culture of an area over a 24-hour period. The gallery becomes an archive of these surveying efforts, built from the community Caballero has constructed to question how histories are written, forgotten, and reclaimed. FreeSpace Collective’s Friebele and Iacovone also deeply consider our relationship to our environments and seek to build new histories through communal activities. The artists engage the communities of Washington, DC and northern Virginia to reacquaint visitors with their surroundings. Friebele and Iacovone become guides in uncovering details forgotten in the bustle of contemporary life and missed in the course of our daily routines. For instance, what do we overlook in a typical day, when our patterns, commutes, and rhythms become predictable? How much do we notice on the very streets that we live? The artists give viewers the opportunity to reconsider their everyday movements around Arlington. Relying completely on visitor involvement, Friebele and Iacovone create two avenues for participation. The Photogrid, representing the network of still-standing boundary stones placed to demarcate the nation’s capital in the 18th century, houses contemporary photographs mined from social media. This includes contributions from both residents and visitors to the gallery. Similarly, Walking as Drawing allows visitors to take an active role, giving them maps to outline their experiences around the Arlington Arts Center, which are funneled into an animated model of the area. For Friebele and Iacovone, the artwork is produced through these collective efforts. Their geographical maps are determined by these social exchanges, where the presence of those involved is most important to the work. In the show, the artists document what they have built through these choice encounters, activating the walls of the Arlington Arts Center. They bring work compiled on the city streets of Arlington and in the expansive landscapes of Utah into the gallery space, and challenge the viewer to respond, react, and join in on these complex practices. In Choice Encounters, the artists shift the function of the exhibition space, building a new community of willing participants and chance contributors.